A wise man once said, “Supper is where you find it.” To harvest tonight’s wild repast, I walked over to our meadow and collected a wild mustard and a Goosefoot (Chenopodium sp.). 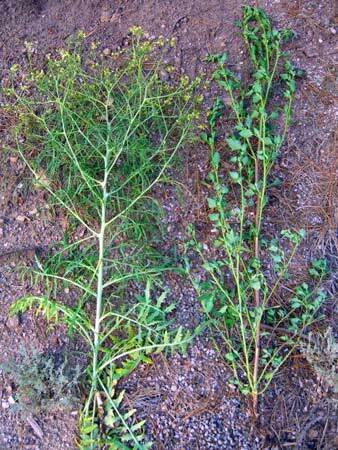 Both plants are 4.5 feet tall. Some might consider them too old for the table, but au contraire, mon amie! 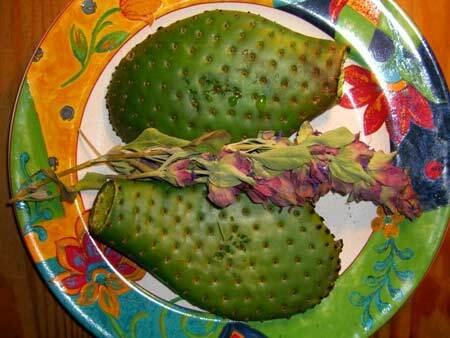 This Beavertail Cactus (Opuntia basillaris var. basilaris) prefers warm south-facing slopes up here at 8000 feet. I can hardly wait until those flowers transform into juicy, sweet, purple fruits! 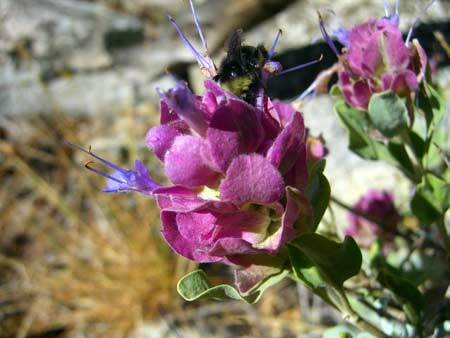 This busy bee is foraging in a Rose Sage (Salvia pachyphylla) flower. It being one of the fragrant sages, I collected some for use as a spice. 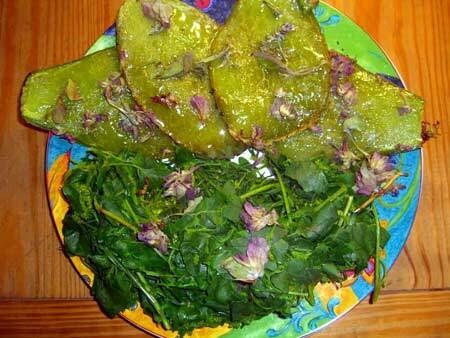 Those two tall greens yielded four handfuls of vegetable matter. 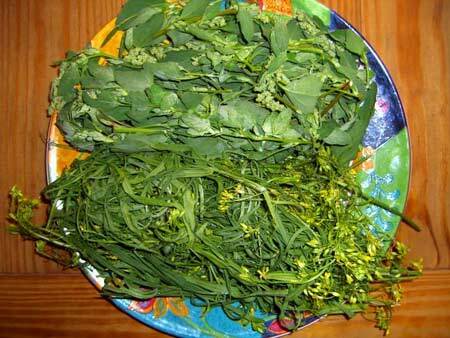 While I could have boiled and subsequently chewed the large-diameter stems, I chose to toss them outside instead. 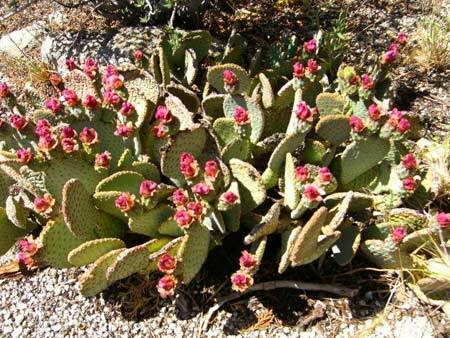 Beavertail cactus is very precarious to handle due to the minute, soft, barbed spines. I flamed them off, then scrubbed the surface of the pads, flamed them again, then scrubbed once more. I did end up with about a half-dozen spines in my hands. There’s the Rose Sage in the middle. 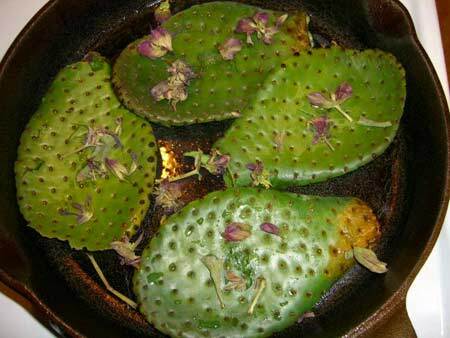 Frying the cactus pads (the inner flesh is also known as nopales). I had previously sliced them in half, so the inner flesh is in direct contact with the cast iron. I did not flip them—saw no reason to. I love my cast iron frying pan—the best implement for cooking mushrooms. I had dried a bunch of Rose Sage earlier in the week. 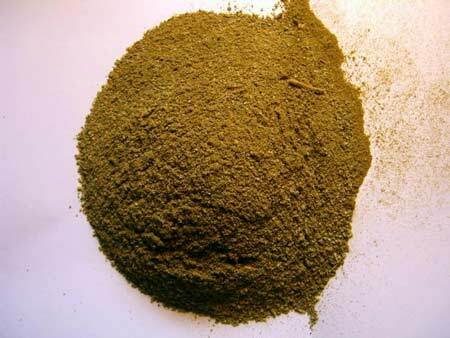 Using a coffee grinder, I powdered the sage for a wild and free and delicious condiment.